Hanoi (VNA) – The Ministry of Industry and Trade (MoIT) and Timor Leste Ministry of Commerce, Industry and Environment signed a memorandum of understanding on rice trade in Hanoi on December 21. 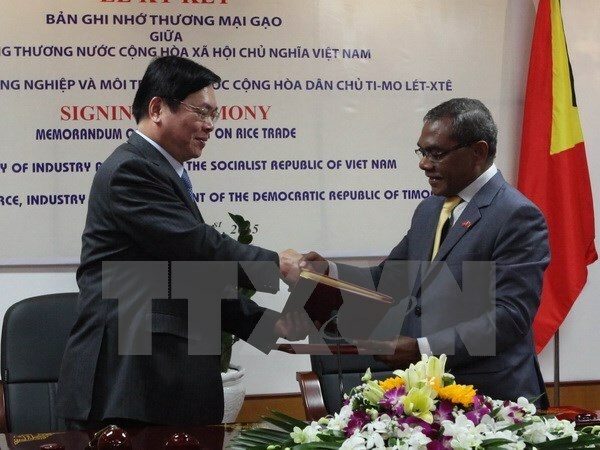 Addressing the signing ceremony, Deputy Minister of Industry and Trade Tran Tuan Anh said Vietnam will not only be a trustworthy partner of Timor Leste in the fields of farm produce, fisheries and rice but also in garment, leather and footwear and electronics. Vietnam will also provide all possible support for Timor Leste’s business operations, he said, adding that there remains room for cooperation in energy, oil and gas, and processing. He said Vietnam wants the Timor Leste government to continue refining policies that encourage investment. Timor Leste Minister of Commerce, Industry and Environment Constancio da Condeicao Pinto, for his part, affirmed that Timor Leste welcomes Vietnamese enterprises to the country to do business. He hoped that both countries would work closely together in the areas of oil and gas and mining in the future. The guest also vowed to complete procedures to approve the bilateral free trade agreement as soon as possible.